The Istituto G. Caporale has had accreditation for its own laboratories since 1995 in accordance with standards ISO/IEC 17025. It uses a laboratory computer system (SILAB) to support all the activities regarding tests on the incoming samples, from acceptance to issue of the report, i.e. the test result. 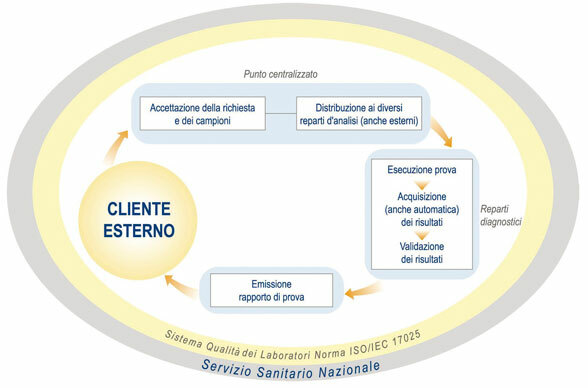 From an organizational point of view, there is a system of "centralized acceptance" for all the area centres, which acts as interface between the Institute and its clients, representing the only authorized point of entry (for checking and introduction of requests and samples) and point of departure (for test reports). The matrices accepted, uniquely identified and prepared, are sent for the relative tests to the analysis departments, which may be in the same centre, or in other centres of the Institute, or at National Reference Centres. The results are captured by the computer system, sometimes by direct interface with the test equipment, and validated by the Technical Manager. At the conclusion of the diagnostic process, the test report is drawn up, in paper or digital format, for the enquirer and for other addressees such as, for example, the Ministry of Health and the Regional Veterinary Service.